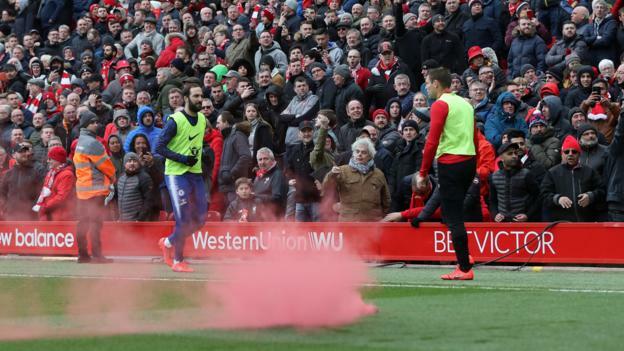 Liverpool are working with police to find and ban the person who threw a smoke device into the away fans’ section during the win over Chelsea. The device, which police initially said was a flare, came from the top tier of the Anfield Road End and landed on Blues supporters below. Police said it caused a nine-year-old Chelsea fan to suffer a panic attack. Liverpool also urged fans to stop “offensive” chants about Chelsea that were heard during Sunday’s 2-0 victory. A club statement thanked Blues staff, officials and supporters for their “compassionate marking” of the 30th anniversary of the Hillsborough disaster, in which 96 Liverpool fans were killed. “The overwhelming majority of those present at Anfield ensured the occasion was a fitting tribute,” the statement adds. “Regrettably, however, a smoke device was thrown into the away section during the second half and we are actively working with Merseyside Police to investigate. “Any person found to have committed this offence will be banned from our ground. “The club is also concerned about a chant from some of our fans, specifically referencing Chelsea, as inappropriate and offensive. The Football Association is also looking into the incident.